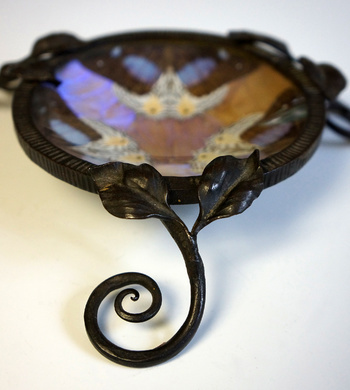 In Art Nouveau > Show & Tell and Art Deco > Show & Tell. Here's another piece that was selected simply because of its beauty and craftsmanship, but I have little by way of information about the maker. 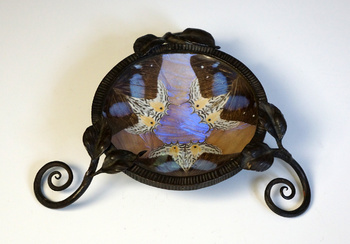 Hand, wrought iron disc supported by wonderfully delicate leaf and scrolled feet with a shallow concave glass bowl underneath is which butterfly marquetry. 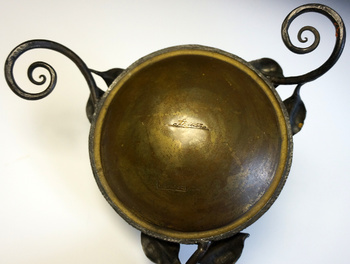 The bottom side is brass with stamped signature and French trademark. Dimensions: 6.10”(W) x 1.5”(H). I have seen these "F. Billère" signed butterfly utilitarian pieces before, either in vide poche or larger sized tray forms. The signature generally is the same on all with sometimes there being the addition of "Depose," which is the case with this little dish. There is a chance that the “F. Billère” signature may actually reference, Billère, the largest city ~20 miles due north of the Pyrénées National Park in Southern France, but this is just a guess. Any attribution information or assistance would be most appreciated. Oh yes they are very beautiful indeed. I love the symmetry and balance of the materials. Thanks all. If others are interested, these "F. Billère" pieces come up every so often on eBay France (ebay.fr) and are fairly reasonable in price. I just wish I knew more about their production. 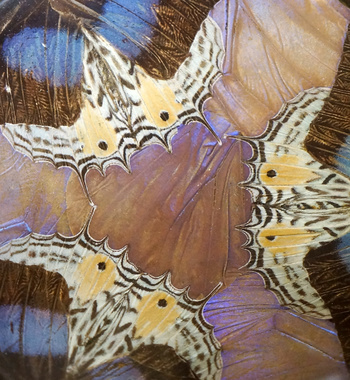 A word of warning, however, only purchase those pieces that are stamped or signed (on the butterflies under glass), as there are a lot of modern marquetry pieces similar to the "F. Billère" works out there. Lovely C. Nice use of butterfly wings. Hi again cogito, I'd not seen any thing like this before nor heard of F. Billère. I love it so much i thought I'd check out prices & can't find any! And only a few on google image search, yours being the first, lol. I guess they come up pretty rarely?